I've been tagged by Sherry of Pattern Scissors Cloth in a game of eight questions. I'm telling you now, if you've never read her blog, go now. This lady is a real live designer and patternmaker - her tutorials are BRILLIANT - really easy to follow and she covers all sorts of really interesting topics. I love me an expert and boy do I appreciate one who is so willing to share her expertise. anyway, enough gushing, on to the eight questions. 1, Which pattern/vintage style have you been thinking about lately? Easy, I've been stewing over The One That Got Away. I spotted this Christian Dior evening dress pattern on Trademe last week, popped it on my watchlist and FORGOT ABOUT IT. I missed the end of the auction, where it failed to garner any bids. It could have been mine for $8. (Insert mental picture of my anguished wailing and wringing of hands right about here) It's been relisted and bidding currently stands at $10.50. I'm reluctant to spend too much on a pattern, no matter how intriguing, if I'm not sure I'll ever make it. I'll see what happens to this one, but boy am I annoyed that I forgot it! And yeah I know I could draft it. It may come to that. I tend to get "focussed". 2, What's the one place you want to visit that you've never been to before? 3, How do you relax? Relax? What's that again? Like many sewers, I sew to relax. I'm not sure whether it makes me strange that I find tedious, never to be seen handstitching (like the catchstitched seam allowances in my last post) restful. Other than slow, meticulous needlework, I go to the gym. It's my "me" time - All About Me. I feel better for the physical activity, I look better because of it, and that also makes me feel better, so it's an important part of my week. 4, What is your favourite holiday? About 10 years ago David and I spent a few days in Fiordland. It is the only time we have ever been away by ourselves (we got together when I was a single Mum with a one year old). We drove Cayden to Wanaka to spend a few days with my parents at Glendhu Bay, then went on to Te Anau. We did a number of fun things while we were there, the best of which was an overnight cruise on the Milford Wanderer. I got my G&T on deck at sunset, but heavy cloud cover (hey, this IS Fiordland!) meant it was less than spectacular. As our only time away alone, it's a pretty special memory. 5, What is one sewing skill you want to learn/try out? Where to start on this one? There are many, many things I want to try, but one I've thought of consistently is proper full-on tailoring. Oh, and a whole lot more about patternmaking than I know now. 6, Can you knit? Crochet? Other crafting talents? I can crochet, but it's not something I've done much of, and I can't follow a pattern without a how-to in front of me to remind me what is a double crochet, treble crochet etc. I've also done a bit of cross stitch and very basic embroidery. I can't draw to save myself. 7, What garment/accessory do you wear the most? I made it when I was pregnant with the twins (lets face it, there was no way much else was going to cover me!) And I lived in it for the latter part of my pregnancy and all through the winter after I had them. It was great to snuggle a baby under while breastfeeding. I'm embarrassed to admit that the next winter and the next (this one) out it came again, and I wear it pretty much every day it isn't in the wash. The sleeves are too short (hey, I was pregnant, I thought I did well to grade and slightly alter a pattern that started at a size 44 [Burda WOF] when I needed a 36. I can't be expected to remember that I have long arms too.) The fabric is cheap synthetic, so it looks pretty dingy now, but at least it dries quickly after washing. It also hangs quite a way away from the front of my body worn loose like this (I had, um, quite a lot more front when I made it) so it does my figure no favours. You'd think I would have enough pride/class that I wouldn't wear it out of the house,but I do. Under a coat, but it gets out! Um, that varies quite a bit. If my sewing is frustrating me or just not inspiring me it can be quite a lot of the twins' daily three hour nap time. (Yep, just turned two and they nap for three hours. I'm not about to mess with that!) Usually about an hour or two a day. I can't help it that there are just so many clever people out there who blog! And I'm choosing to answer 8b as well. I have two. The first has been my signature line on Patternreview for all the years I've been a member. "There are no sewing mistakes, only opportunities for design features" It's been much commented on over the years, so I think I've struck a chord with a lot of people! The other is our house rule - "Be nice or be quiet" Exactly the same sentiment as "If you can't say something nice..." etc, but it has an air of parental command about it! An implied "or else!" attitude that kids sometimes need. One day I want to make a wall hanging of this. Keely of Keelysews who is my BFF in real life. Despite this I don't know her answers to these questions! 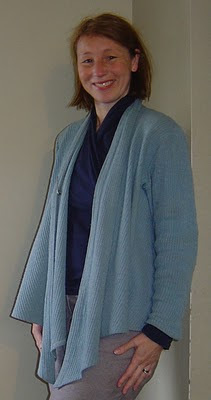 Kristine of Beangirl, who is just funny and clever and worth visiting just for the giggle even if she didn't sew. Kathryn of Les Petits Anglais because I'd just like to know more about you! Katie at Kaddidlehopper because she leaves such nice comments and makes such cute stuff. Gail at My Fabrication because she makes beautiful clothes from beautiful fabrics that I love to look at. And I'm going to leave it at that because some others I would have tagged have already been by others. My apologies if I've doubled up! I'd love to learn more about everyone. It's nosy, but so interesting! thank you Judy, that is such a lovely compliment! I enjoyed reading about you and will try my best to be interesting. Thanks! I'm contemplating my answers now... I'[m not sure they'll be as fun as yours! I love the cardy = nursing cover. Brilliant! Must remember that should it come up again. Thanks for playing - I'm amazed how much you can learn about someone just from 8 questions! That CD dress was calling my name too, but no buying allowed for me at the moment!